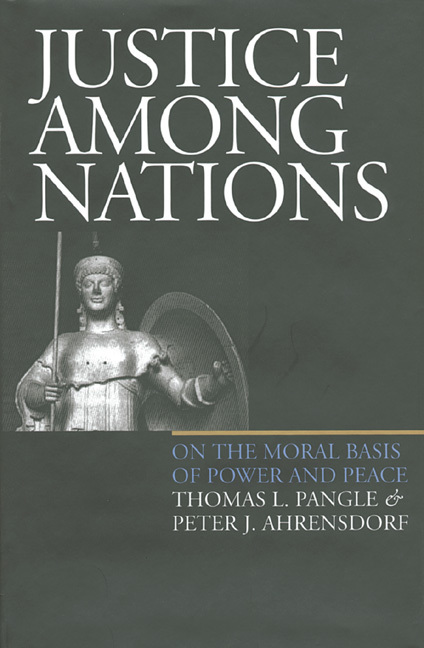 Thomas Pangle and Peter Ahrensdorf provide a critical introduction to the most important conceptions of international justice, spanning 2,500 years of intellectual history from Thucydides and Plato to Morgenthau and Waltz. Their study shows how older traditions of political philosophy remain relevant to current debates in international relations, and how political thinkers through the centuries can help us deepen our understanding of today’s stalemate between realism and idealism. Pangle and Ahrensdorf guide the reader through a sequence of theoretical frameworks for understanding the moral basis of international relations: the cosmopolitan vision of the classical philosophers, the “just war” teachings of medieval theologians, the revolutionary realism of Machiavelli, the Enlightenment idealism of Kant, and the neo-realism of twentieth-century theorists. They clarify the core of each philosopher’s conceptions of international relations, examine the appeal of each position, and bring these alternatives into mutually illuminating juxtaposition. The authors clearly show that appreciating the fundamental questions pursued by these philosophers can help us avoid dogmatism, abstraction, or oversimplification when considering the moral character of international relations. Justice Among Nations restores the study of the great works of political theory to its natural place within the discipline of international relations as it retrieves the question of international justice as a major theme of political philosophy. It provides our moral compass with new points of orientation and invites serious readers to grapple with some of the most perplexing issues of our time. Peter Ahrensdorf, James Sprunt Professor of Political Science at Davidson College, is the author of: The Death of Socrates and the Life of Philosophy: An Interpretation of Plato's Phaedo; Greek Tragedy and Political Philosophy: Rationalism and Religion in Sophocles’ Theban Plays; Sophocles’ Theban Plays, with Thomas Pangle; and Homer on the Gods and Human Virtue: Creating the Foundations of Classical Civilization.